The Golden State Warriors have won three consecutive games, but it's clear that the team misses having Stephen Curry on the floor. Now it appears that the Warriors could get their superstar guard back in the lineup soon. 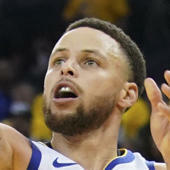 On Tuesday, Curry was a full participant in the team's practice and head coach Steve Kerr said Curry will make his return against the Detroit Pistons on Saturday. On Monday, Curry participated in a closed scrimmage with some of the team's assistant coaches and younger players. Assistant coach Willie Green, who played 12 NBA seasons, was one of the coaches that participated in the scrimmage that took place at the team's practice facility. Following that closed scrimmage, Kerr suggested that Curry "might" play against the Toronto Raptors on Thursday when he spoke to the media prior to Monday's game, but it appears that he may be held out until the weekend. "Steph looked good today," Kerr said prior to Monday's 116-110 win over the Orlando Magic. "Totally dominated the film crew. They couldn't guard him. Willie Green put up a pretty good fight, but he's a couple of years past his prime, too." While Curry will likely be held out of the lineup once again, the rest of the Warriors will be in action on Thursday night when they meet the Raptors in Toronto (8 p.m. ET -- Watch on fuboTV with NBA League Pass extension). Curry has missed the last 10 games after suffering a groin injury against the Milwaukee Bucks back on Nov. 8. The All-Star guard ended up coming up lame on a fast break play in the third quarter of that game and eventually left the contest. Curry suffered a moderate groin strain that has kept him out of action since that night. The previous expectation was that Curry would return at some point during their five-game road trip that begins on Thursday against Toronto. Now it appears that Saturday's contest against Detroit could be in play for the star guard's triumphant return.